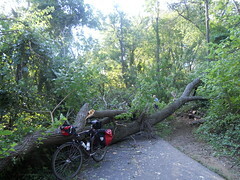 Bike Commute 93: Hurricane Irene Is No Match for My Sequoia, a photo by Rootchopper on Flickr. Irene thought she was tough. She thought she could keep me from riding to work. She was wrong, so wrong. This tree is no match for the powers of the Sequoia. Bwa Ha Ha! To their credit the National Park Service was out with their clean up crews today. They had this bad boy chopped down to size and cleared away for the evening commute. Irene Aftermath, a photo by Rootchopper on Flickr. Irene was a massive storm and the winds during the overnight hours had us all worried, especially after we lost power at 2 am. I went out in the morning to assess the damage and this was it. 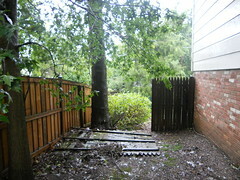 A section of a crummy old fence had blown over. Hopefully the crew that demolishes my deck tomorrow will cart this off with that debris. 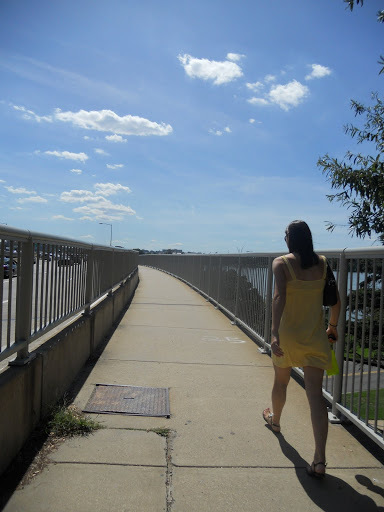 Just Another Bike Commute: Not! It started out like any other day. 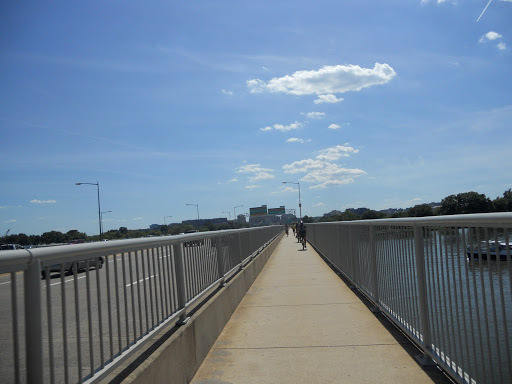 I rode my bike along the Potomac River with a nice tailwind. It being Friday and a day on which my calendar at work was empty, I didn’t go very fast., When I arrived in DC I figured I could take a few minutes to check out the newest (although officially still unopened) monument. 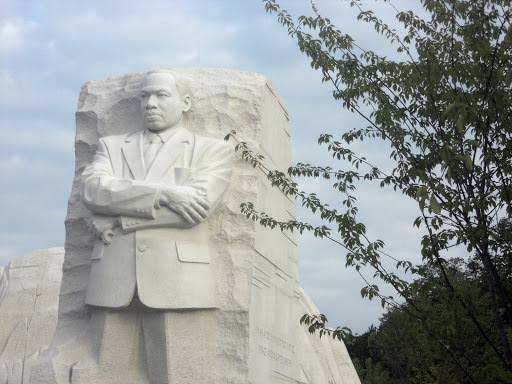 The Martin Luther King Memorial is nicely designed. The man himself is carved out of a giant block o’rock like some sort of Mount Rushmore in miniature. He looks out over the Tidal Basin more or less toward the memorial to that noted slave owner Thomas Jefferson. 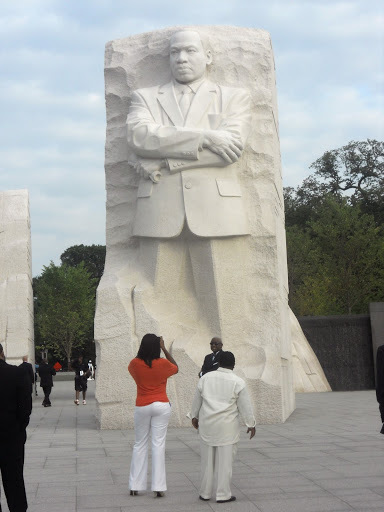 The memorial includes some stone walls that showcase some of Dr. King’s inspiring words. I couldn’t see much of them because the Park Service had erected an attractive chain link fence to keep me from enjoying the memorial too much. I am sure there is some deep meaning in the fence keeping me from fully appreciating the memorial. I trust they will remove it soon. Having escaped the imaginary clutches of Jobba the Hutt using my frame pump as a light saber, I made it to work with 15 minutes to spare. Tailwinds are grand. The ride home took on a quite different flavor. It was super muggy and a steady wind was in my face. 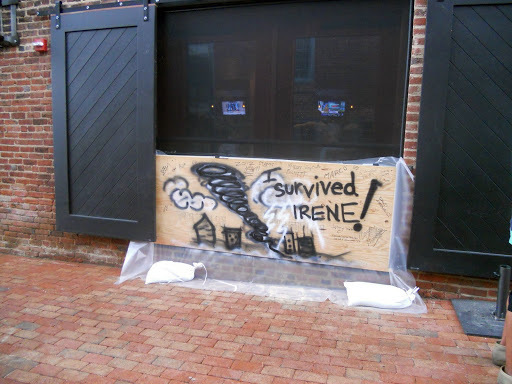 Preparations for the arrival of hurricane Irene were visible here and there. 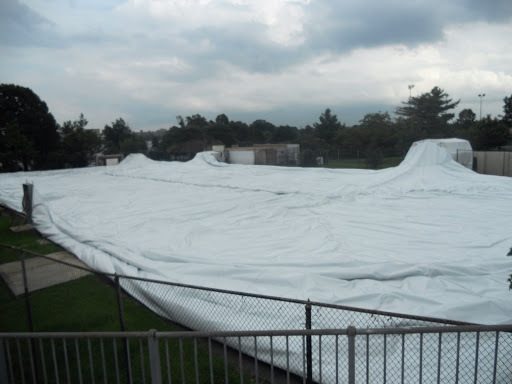 The tennis bubble in East Potomac Park had been deflated. I think this is a shame because I’ve always wanted to see what one of those suckers looks like when it is airborne. Oh well, another time. As it is, it looks like a giant came along and was preparing to fold his bed linens. 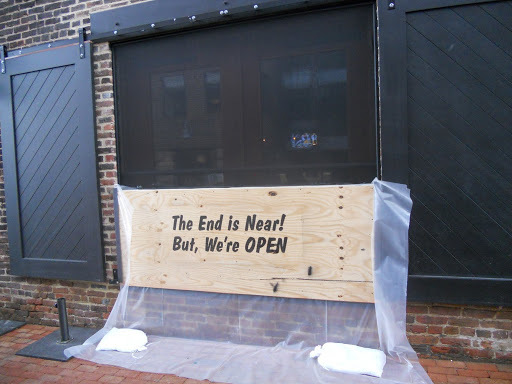 In Old Town Alexandria, the shop keepers on Union Street had spent the day preparing for the usual flood. Union Street is one block from the Potomac and it sits at the base of a hill down which storm water cascades. Basically it’s a mess every time we have a big storm or a snow melt. 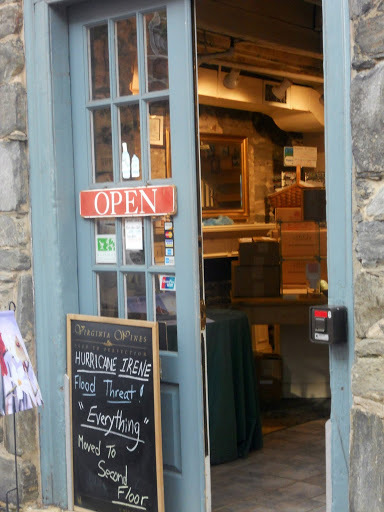 The first floor of the Virginia Store, which sells stuff made in and about Virginia, is several steps below the sidewalk. These folks were nearly wiped out when hurricane Isabel came through a few years ago. 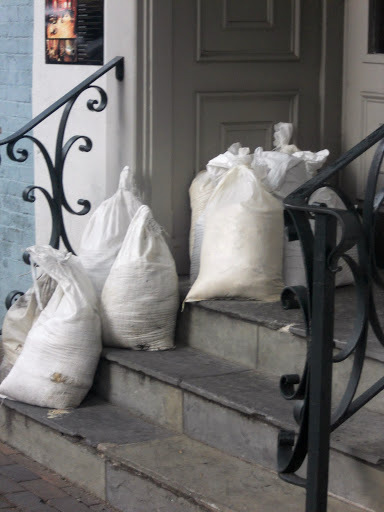 This time they moved all their wares to the second floor BEFORE the storm arrived. .
Across the street the Firehook Bakery took advantage of the sandbags provided by the city. This is pretty typical for shops along this street. I hope it does some good. If you’re facing an utterly miserable couple of days, you might was well go with the flow, so to speak, and have fun. 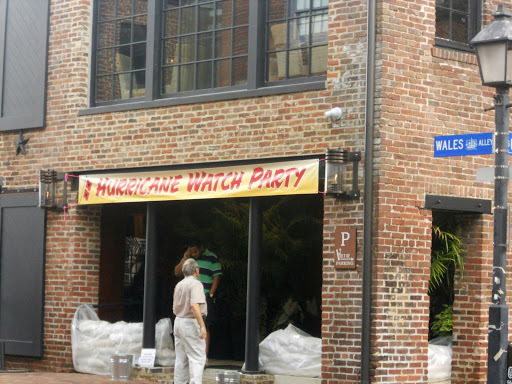 This saloon is throwing a hurricane watch party. 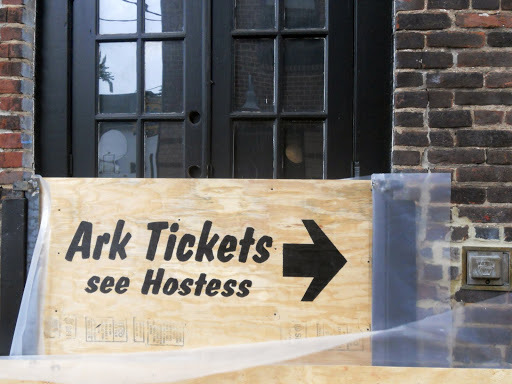 Let’s hope the revelers have dry feet when the party ends. Good luck all you East Coasters. 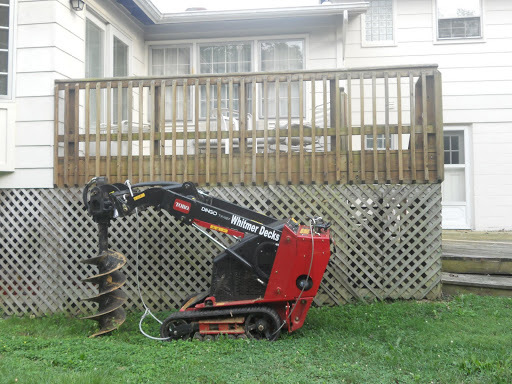 Let’s hope Irene is as interesting and innocuous as the Mineral Virginia earthquake earlier this week. 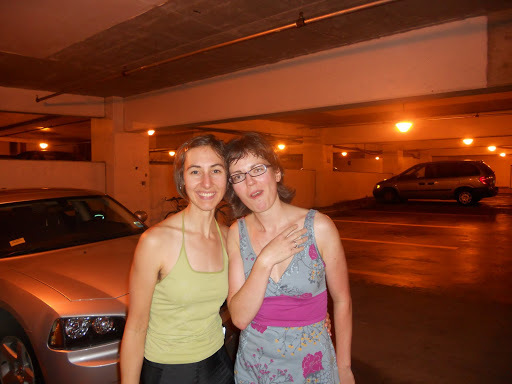 Bike Commute 91: Earthquake Detour, a photo by Rootchopper on Flickr. Gadsby’s Tavern, a colonial era building is at the far end of this block on the left. Alexandria City Hall is on the end of this block on the right. Both were reported to have been damaged by the recent 5.8 earthquake and strong aftershock in the early morning hours today. Most people don’t know what a velomobile. And most of those who do think they are big, heavy little Fred Flinstone-mobiles that you pedal if you live in the Netherlands – which apparently means Pool Table Land in English. To dispel these ignorant notions, an event showcasing velomobiles came to Portland Oregon in July. Roll over America was a coast-to-coast velocade. Basically, a whole mess of velomobiles lit out from Portland with the grand ambition of arriving in Washington DC in about a month’s time. And they did it. 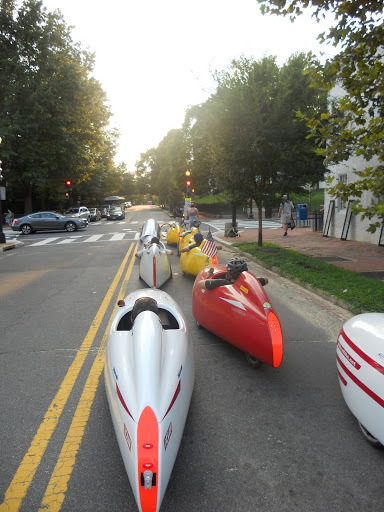 My friend Charmaine persuaded me to join her in greeting the velomobiles as they entered DC. 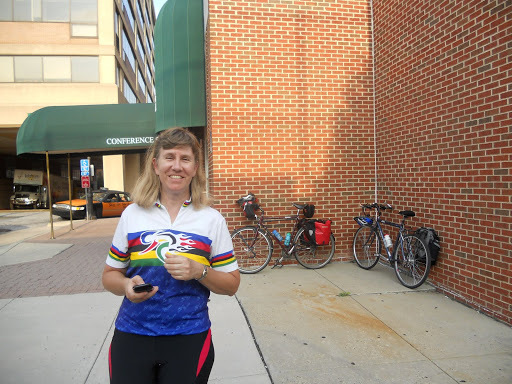 After waiting around for an hour at the finish line at the Georgetown University Hotel, we rolled downhill to the intersection of the Key Bridge and M Street NW in Georgetown. We waited another 20 minutes and were about to give up when, one by one, a steady stream of velomobiles of all colors and designs came in to view. 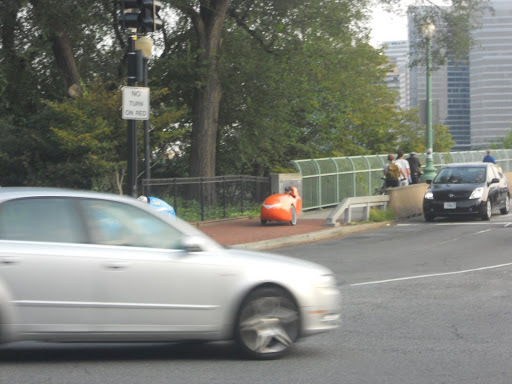 We rode over to Wisconsin Avenue to get a closer look and were delighted to see one velomobile after another cruise up from M Street. The riders were clearly punped up as they rode the final mile of their cross country trek. 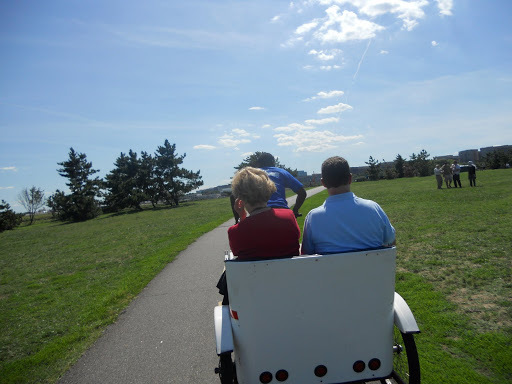 After taking several pictures, Charmaine and I mounted our trusty steeds and gave chase. I was expecting the velomobiles to crawl up the hill to Reservoir Road. If the riders were laboring from their efforts they showed no signs of it. 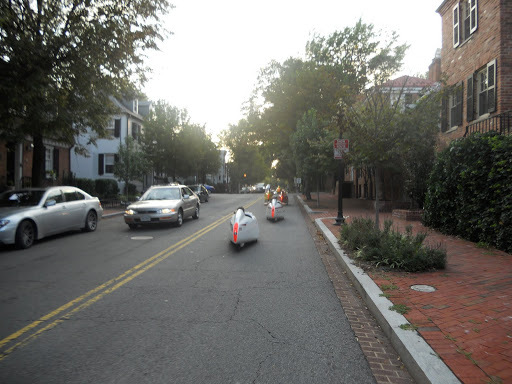 The velocade turned on to Reservoir and finished by riding straight into the Georgetown University Hotel parking garage. 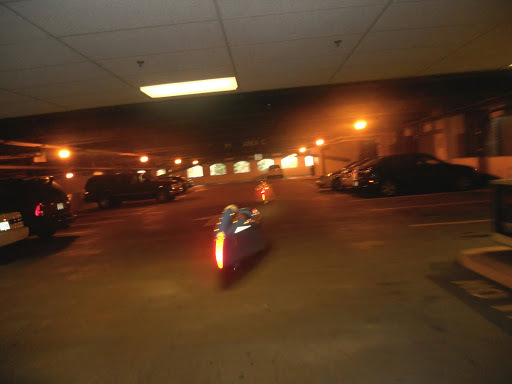 Then down several levels they went until they arrived at four nondescript parking spaces. Here they came to rest with riders hoping out of their machines. A couple of young women stood with us and the riders taking pictures. 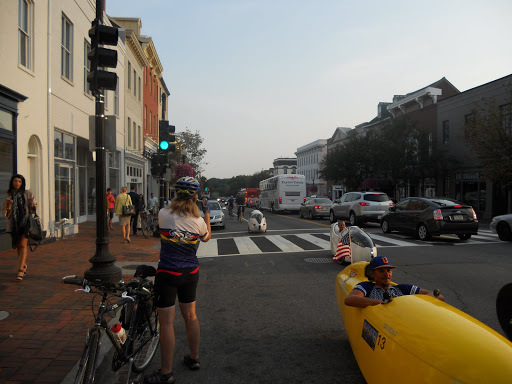 They had ridden down to Georgetown from Bethesda on the Capital Crescent Trail to catch a glimpse of the show. They arrived at Key Bridge just as the first velos came of the Key Bridge. We all enjoyed congratulating the velo riders and taking copious pictures of the finale. 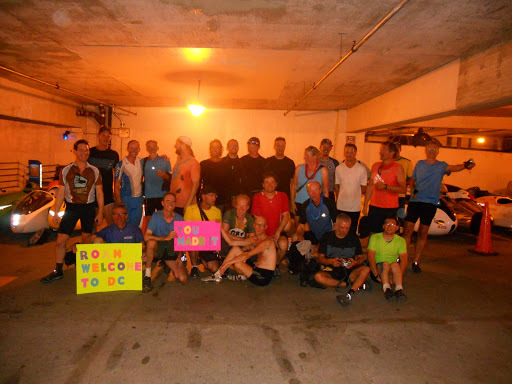 Fantastic job to all the participants and their support crew. What a beautiful day. As a bike commuting day this was an eleven. This time of year is prime commuting weather. In retrospect it was quite similar to the weather ten years ago when a perfect day turned into madness. I left home a little late and thought I had a 9 am meeting so I put the hammer down. I NEVER do this but I needed to get to work fast. I was really feeling my oats, despite a 10 mph headwind. For about four miles I followed this guy in a red shirt. 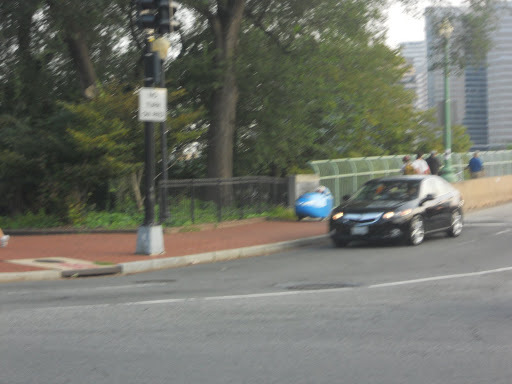 Here he is on the right with a rider passing both of us about six miles from my office. Just look at that sky! It was heaven out there. 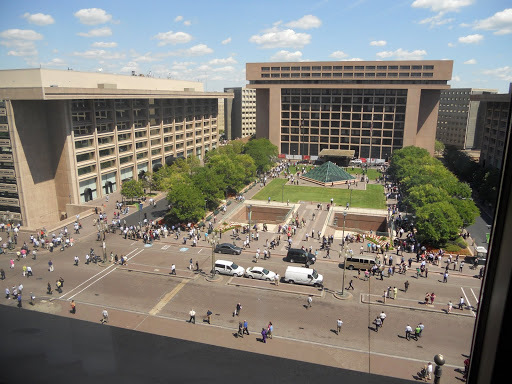 L’Enfant Plaza is not the ideal place to be when an earthquake hits. For starters it is built on mud flats. To add to the fun, the roadway in front of our building is actually a bridge and it is not in very good shape. After about 30 minutes we were allowed back inside to get our belongings and leave for the day. I lucked out and rode the elevator to my office before they were shut down for the day. The ride home was nothing short of splendid. Puffy little clouds drifting by, a nice cooling breeze, and a tailwind all the way home. 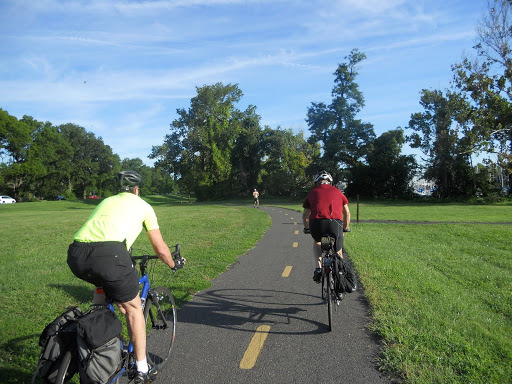 I ride to work every day on the Mount Vernon Trail. I normally see a dozen or so people that I call my regulars. The 40 something runner with the odd hop in his stride, the smiling woman cyclists always headed in the opposite direction, the guy with a single speed bike who commutes miles and miles in his street clothes all year long. Lately I have been seeing a homeless man in the morning. I imaging he sleeps overnight in Dyke Marsh, far from the eyes of the authorities. His clothing is little more than rags. Last week he wore cutoff trousers for shorts. They had long tears in them through which you could see the white of his behind. He’s always heading north. Alone. On the way home I was fighting a strong head wind. After 6 miles or so, I rode over a long boardwalk. Out of the corner of my eye I spotted something along the edge of the marsh grass. 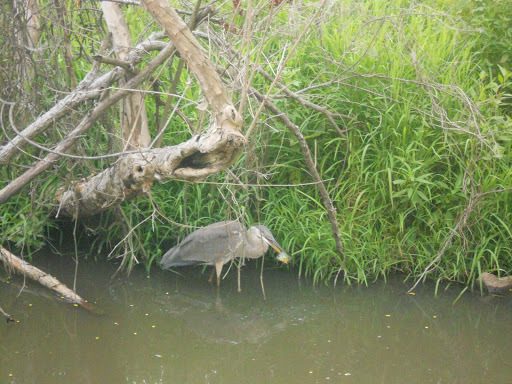 It was a heron with a tiny fish in its beak. The fish was slightly larger than a poker chip. He seemed to have trouble ingesting it. I left him to his repast and headed off for home. 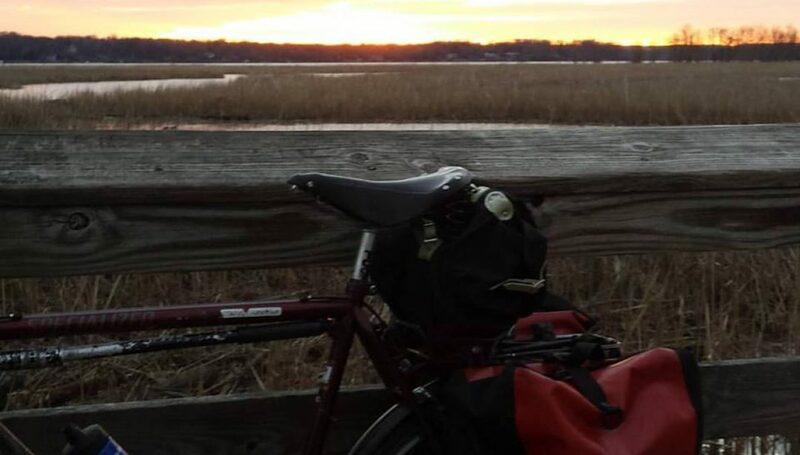 Bike Commute 85: Little Nellie and the Mystery Post, a photo by Rootchopper on Flickr. Did you ever get the feeling that someone is watching you? Little Nellie does. Especially when she spots a monitoring device along the trail. I’ve never seen this gizmo emit a light. And I have never seen anyone go near it. It just sits there observing. Taking count. Probably making us safe from bike trail terrorists. Don’t you feel better now? Just wait until I show you the mystery building in East Potomac Park. Sitting there behind a tall fence. Why? Don’t ask. Never ask. It’s for your own good. 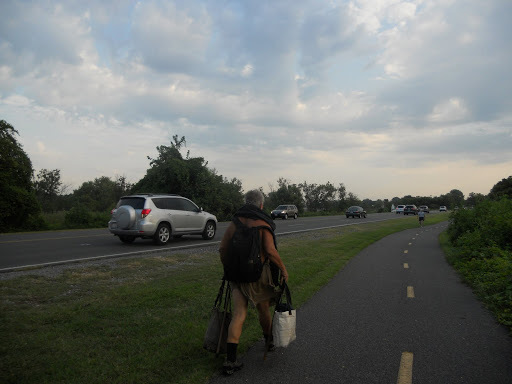 Bike Commute 83: Jamey Turner Plays Mozart, a photo by Rootchopper on Flickr. Every so often I stop on my way home from work and check out the street performers in Old Town Alexandria. 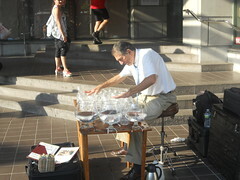 Jamey Turner has been playing his glass harp now for as long as I can recall. If you haven’t heard him, check him out on YouTube. He’s an original. 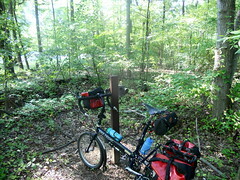 Bike Commute 81: Bonanza NPS, a photo by Rootchopper on Flickr. Last night as I was passing by the Jefferson Memorial, three park police officers came clip clopping up the street on their steeds. Can you tell which one is Hoss? 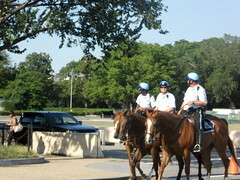 Mounted police around these parts is pretty commonplace. I think they add a nice touch to daily grind here in DC.